At the 2008 Winter NAMM Show – the largest North American music industry convention, Numark introduced an interesting iPod Turntable. The TTi iPod turntable is a turntable that includes a Universal Dock for iPod, USB audio interface, a metal platter and pitch control, making it one of the most versatile turntables ever produced. The included software archives records directly to your iTunes Library for transfer to CD or any MP3 player. The software also automatically reduces pops and clicks inherent on some old vinyl recordings. Owners of iPod (Classic or 5th generation) and iPod nano (2nd or 3rd generation) can record from vinyl directly to an iPod without a computer. People with other iPod models can transfer captured vinyl recordings to their iPod by using iTunes to transfer the tracks after recording. 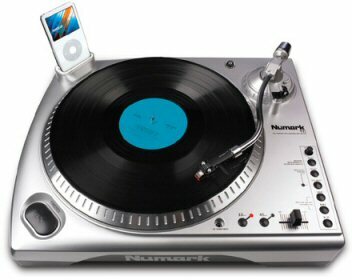 Numark‚Äôs TTi turntable will be available Q2 – 2008 from most musical instrument retailers with an MSRP of $449. do I need a computer to use it item , or can I just use the turntable and my ipod. Thanks for the great article. Keep up the good work.